Some Christians claim to reject Tradition in preference to a supposedly "Bible only" Christianity. Catholics, on the other hand, venerate Tradition, yet often without adequately understanding it. In this masterful book, the great theologian Yves Congar explains why Tradition is an inescapable aspect of a fully biblical Christian faith. He explores the various forms of Tradition and discusses the relationship between Scripture and Tradition, as well as the role of the Magisterium of the Church. The Meaning of Tradition clears up misconceptions held by many Evangelical Christians and even some Catholics on this important subject. Congar's study of Tradition greatly contributed to the teaching of Vatican II and to a deeper appreciation of the Church Fathers. 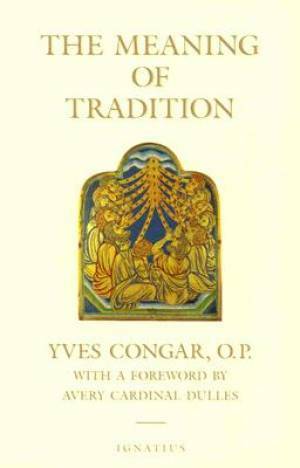 The Meaning of Tradition by Yves Congar was published by Ignatius Press in December 2004 and is our 50926th best seller. The ISBN for The Meaning of Tradition is 9781586170219. Be the first to review The Meaning of Tradition! Got a question? No problem! Just click here to ask us about The Meaning of Tradition.